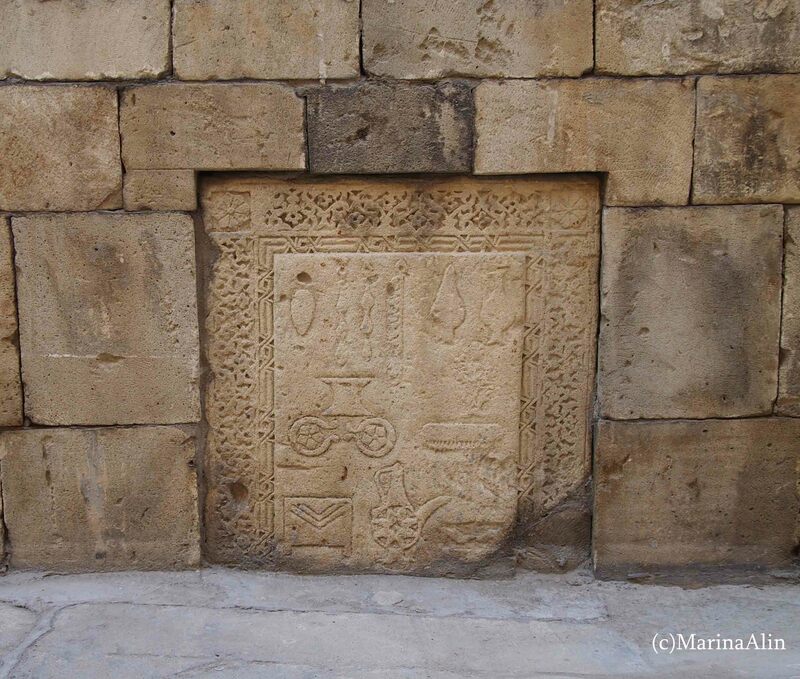 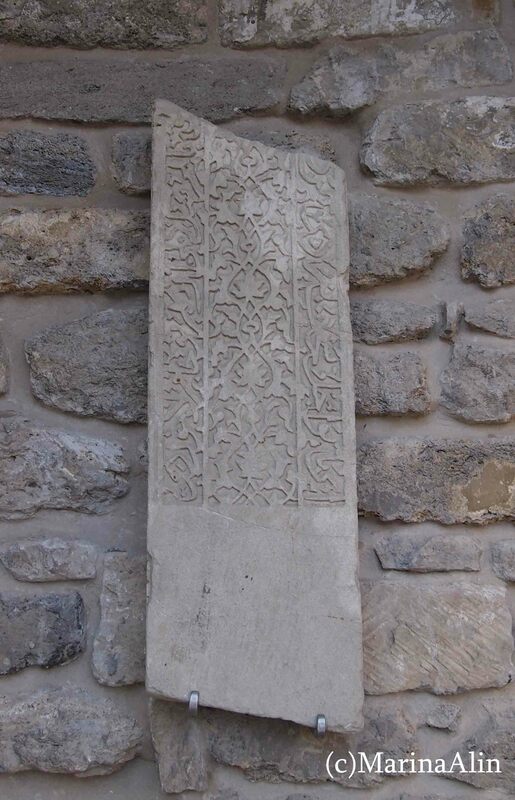 Stone decoration of Baku architecture is superb. 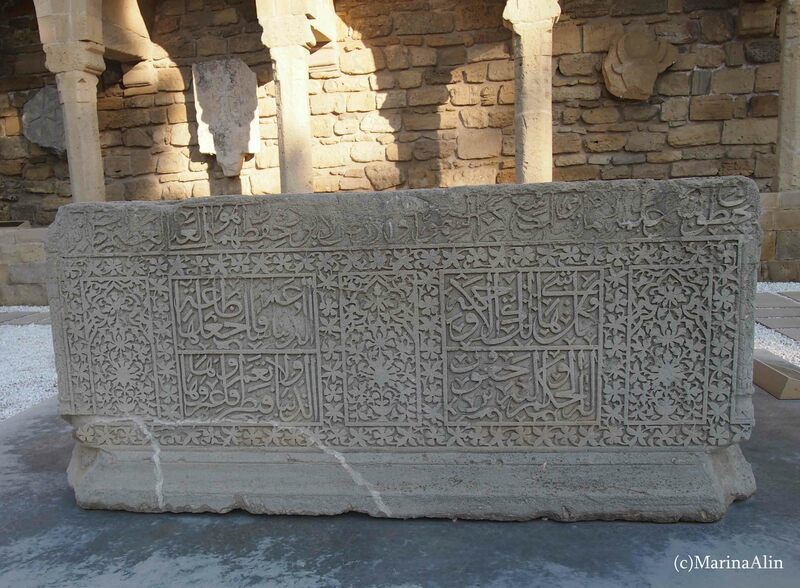 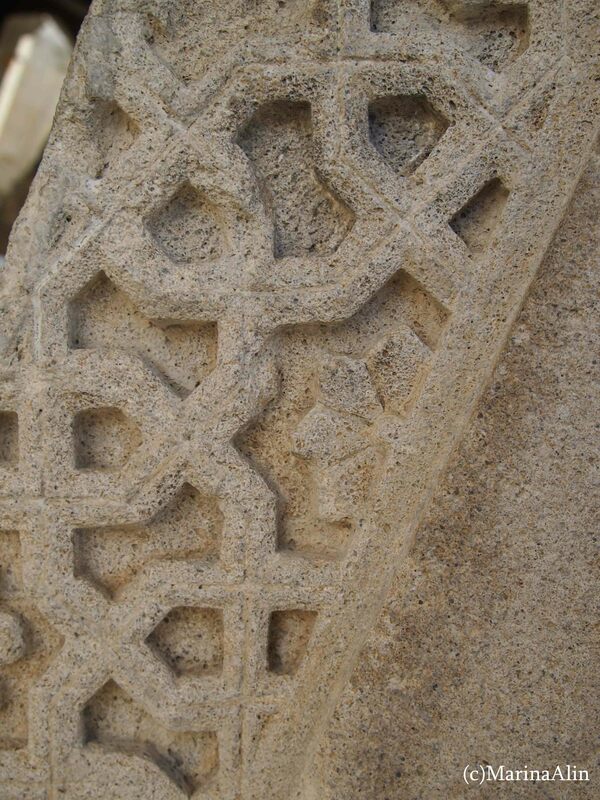 It is here when ancient craft of stone carving serves Islamic art showing the great level of craftsmanship and an elegance of artistic expression. Baku is a capital of Azerbaijan, a land of fire, wind, stone, rich art tradition and beautiful people; a land where the “evidence of Zoroastrian, Sasanian, Arabic, Persian, Shirvani, Ottoman, and Russian presence in cultural continuity” . 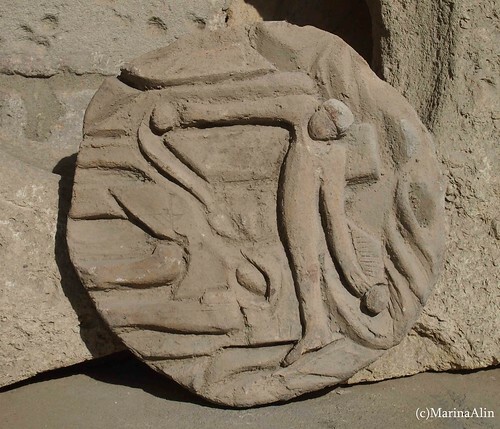 Stone carving is a traditional craft of Caucasian people with a history started 40000 years ago . 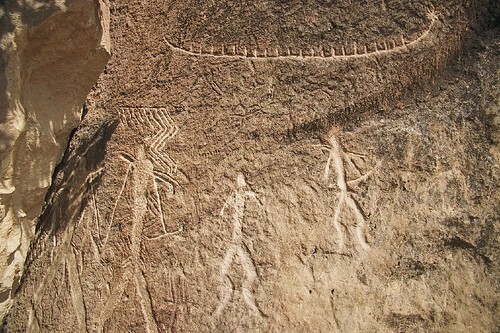 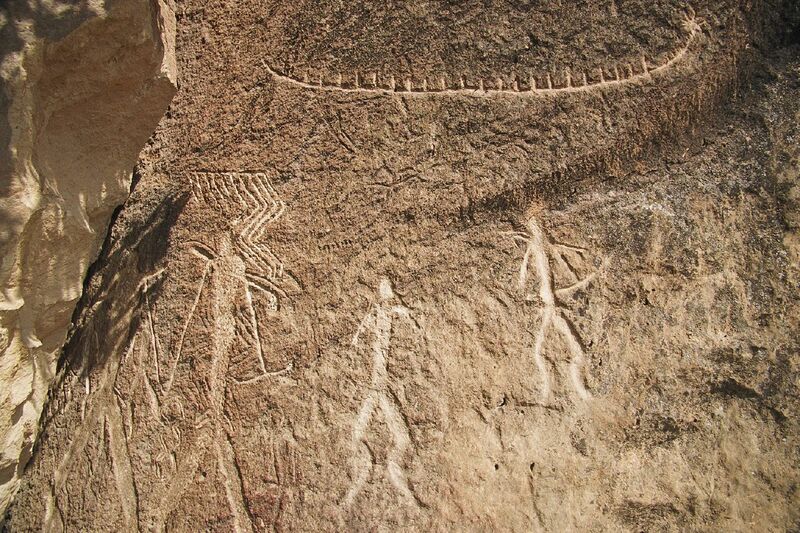 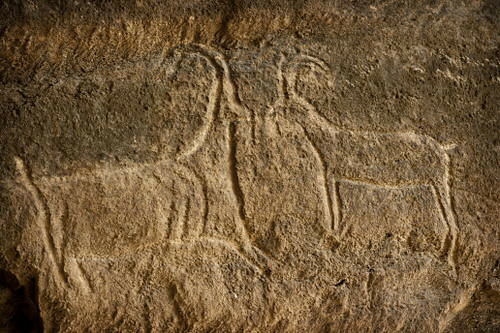 Petroglyphs or rock engravings of Gobustan – a site near Baku, show the life of pre-historical men and the evidence of a technique that goes back to millennia. 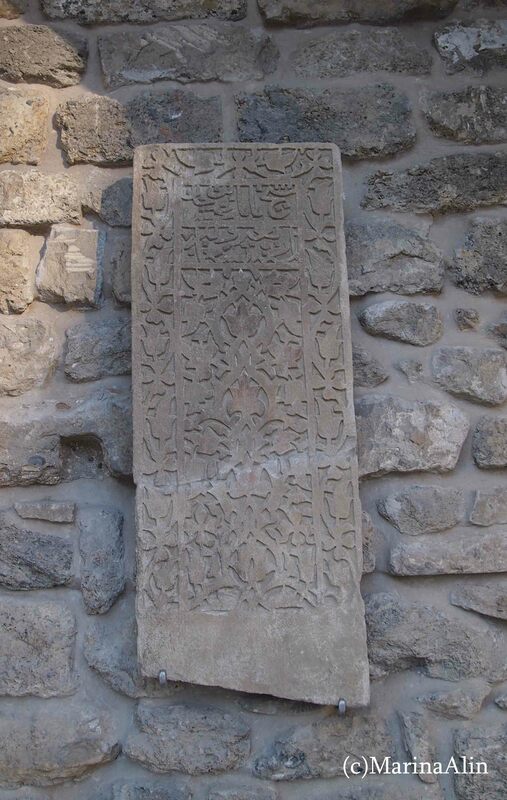 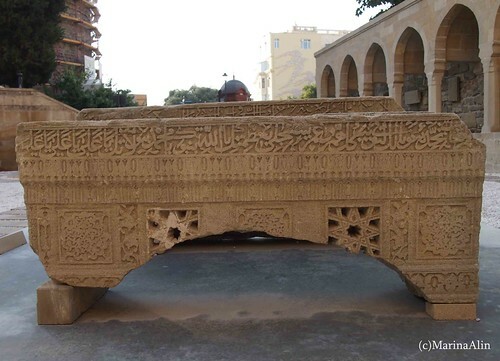 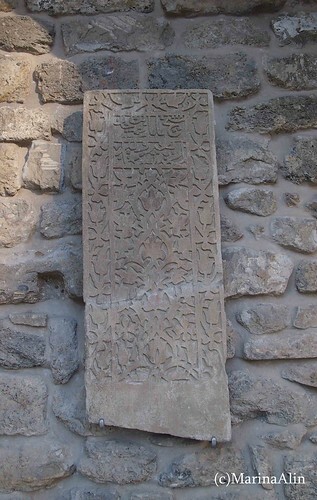 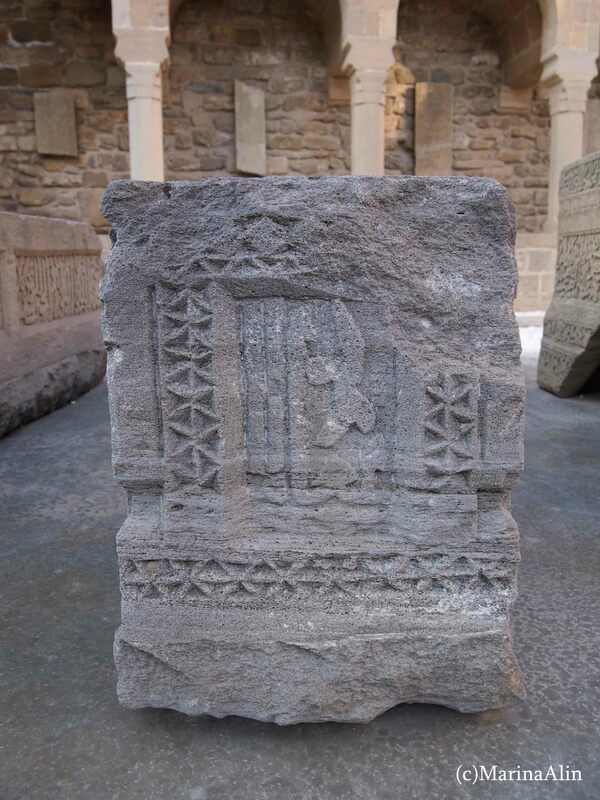 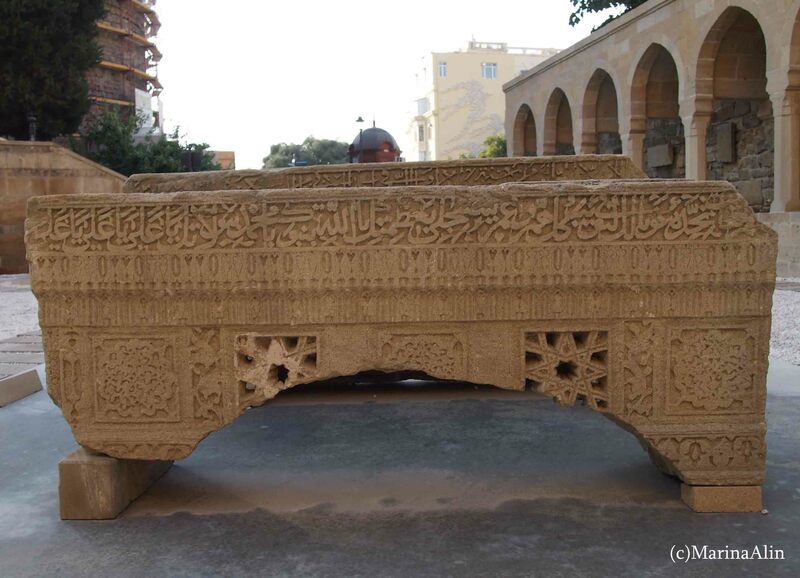 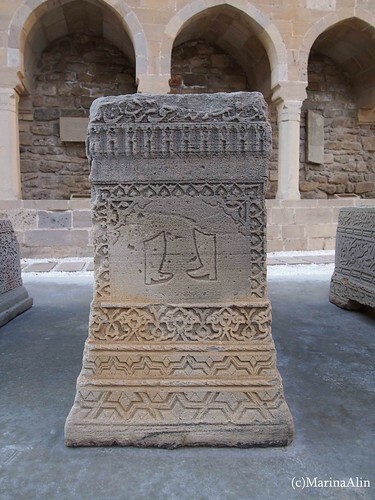 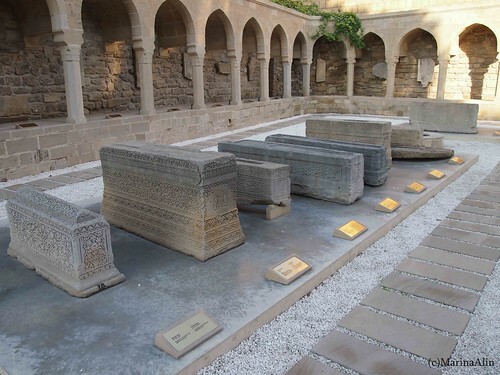 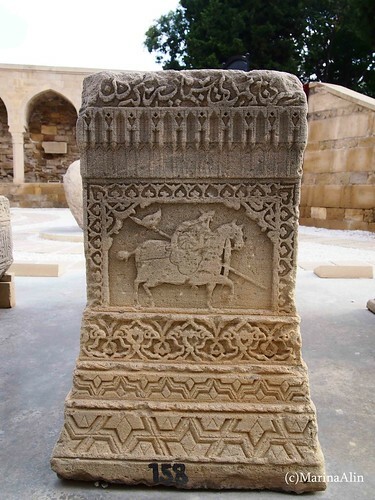 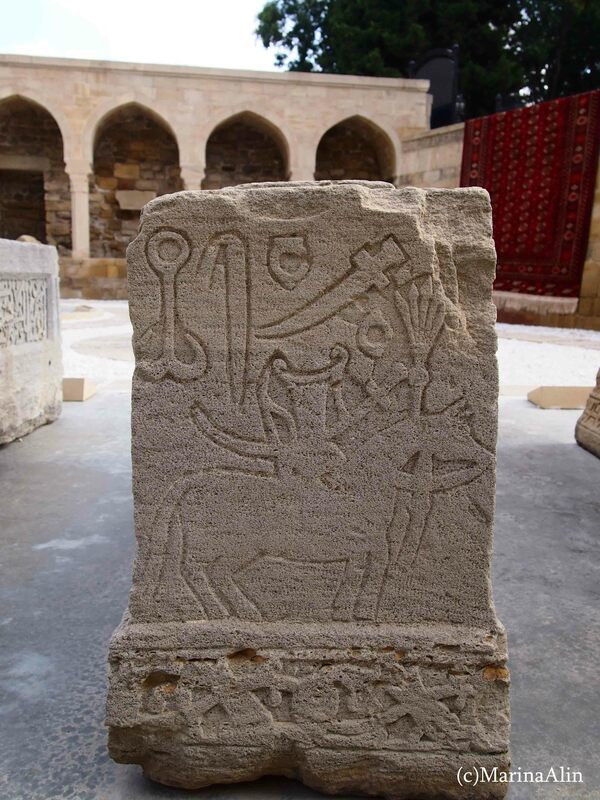 Stone carved art objects in Baku are the decorations of Shirvanshahs’ palace, minarets, gravestones and some building remains found in and around Baku. 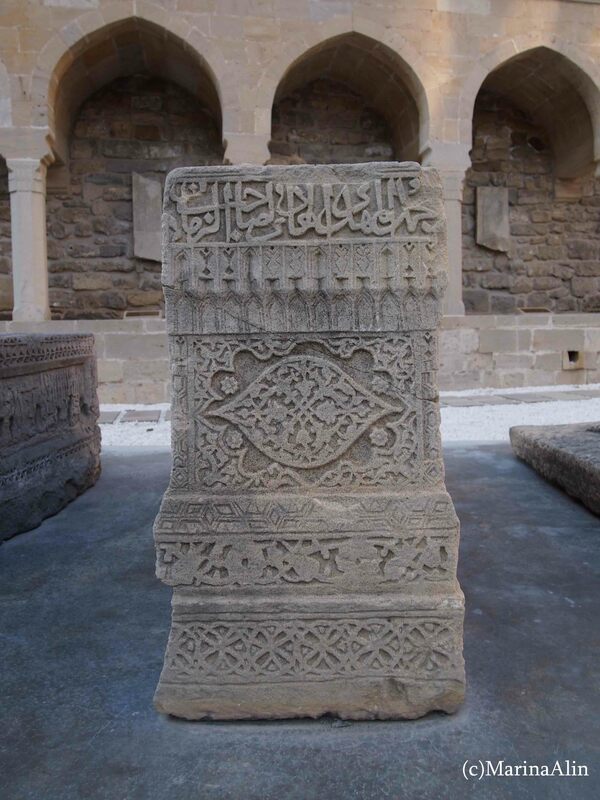 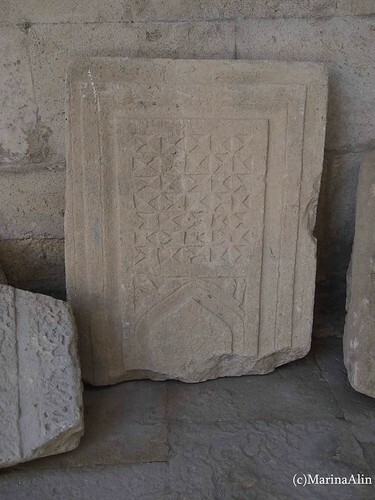 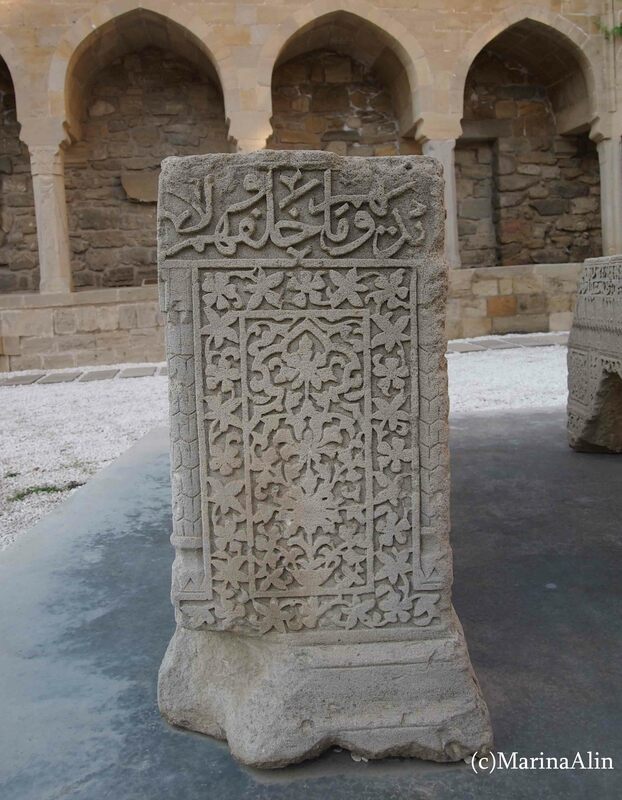 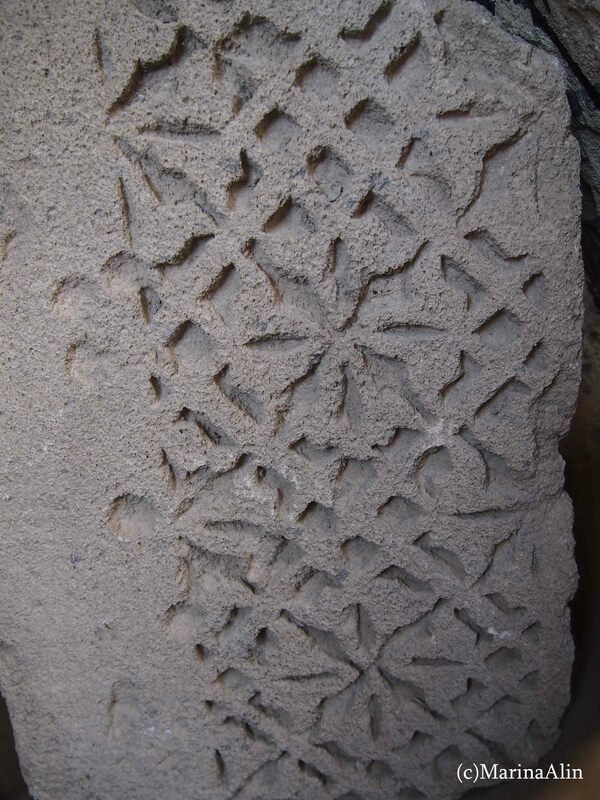 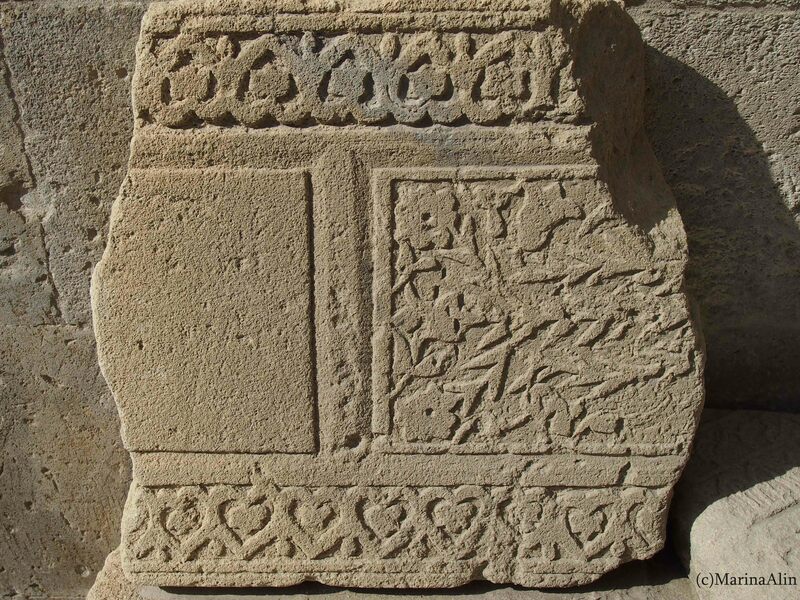 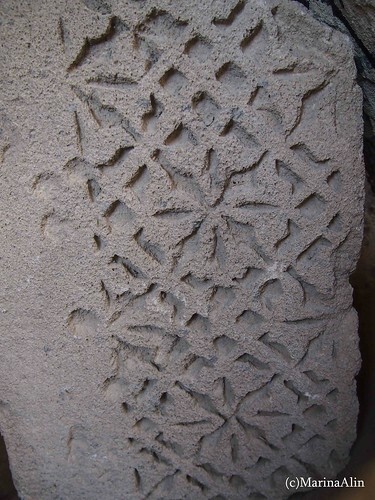 Apart from brought to Baku Gobustan rocks, all motifs of stone decoration are purely Islamic. 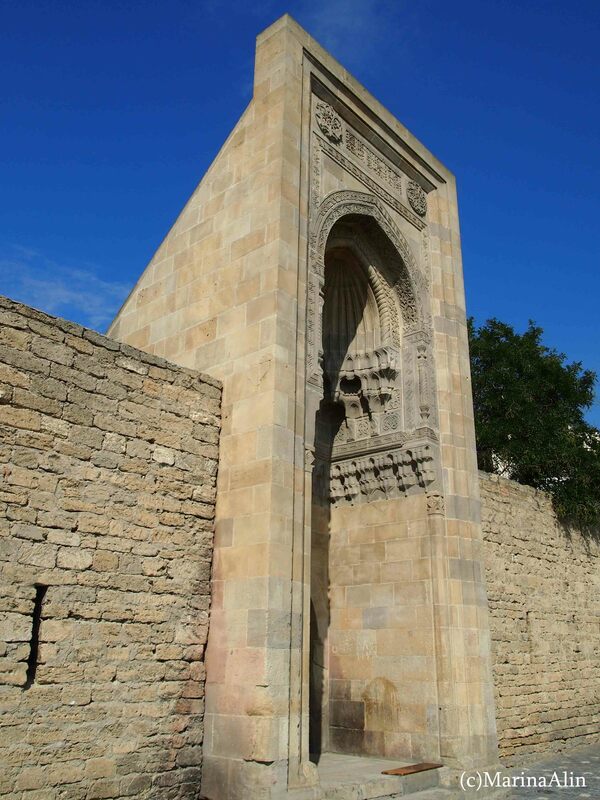 Islam came to Azerbaijan in 7th century with Arab invasion. 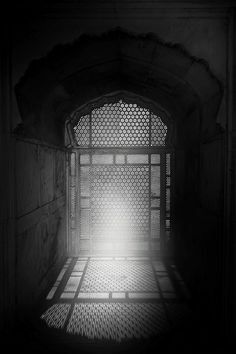 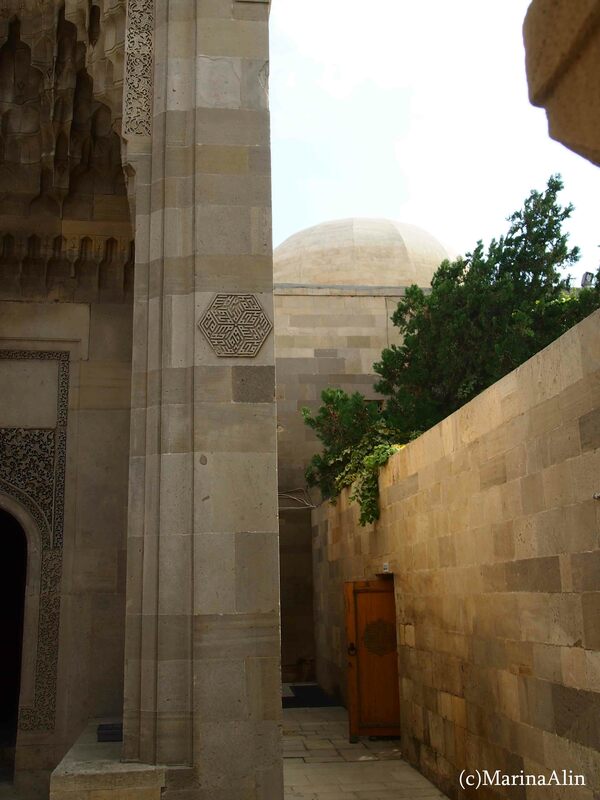 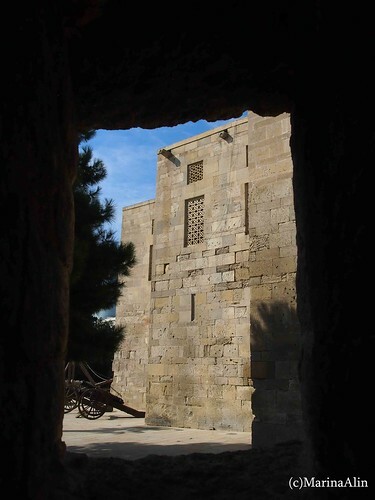 Shirvanshahs’ palace was constructed in 13-16th century for Shakhs of Shirvan, when the capital of Shirvan state was moved from Shemakha to Baku. 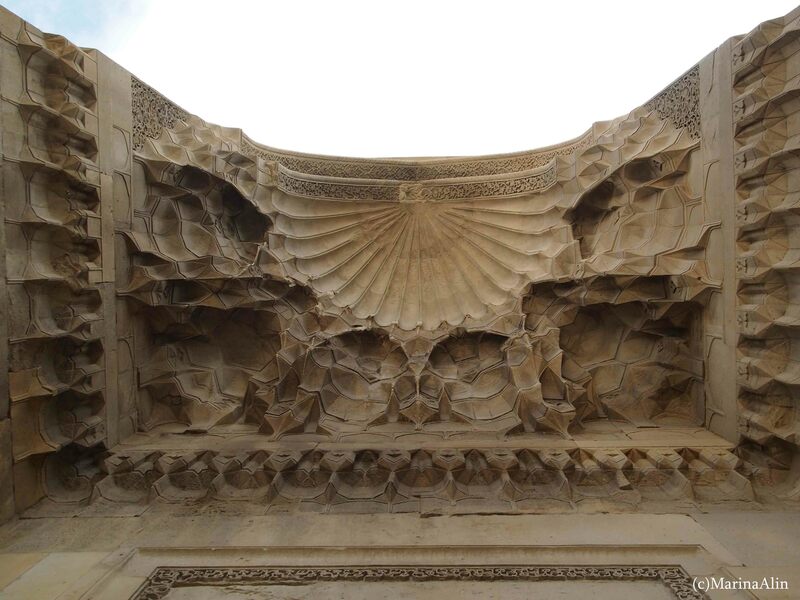 The decoration of Shirvanshahs’ palace dates 15th and 16th century. 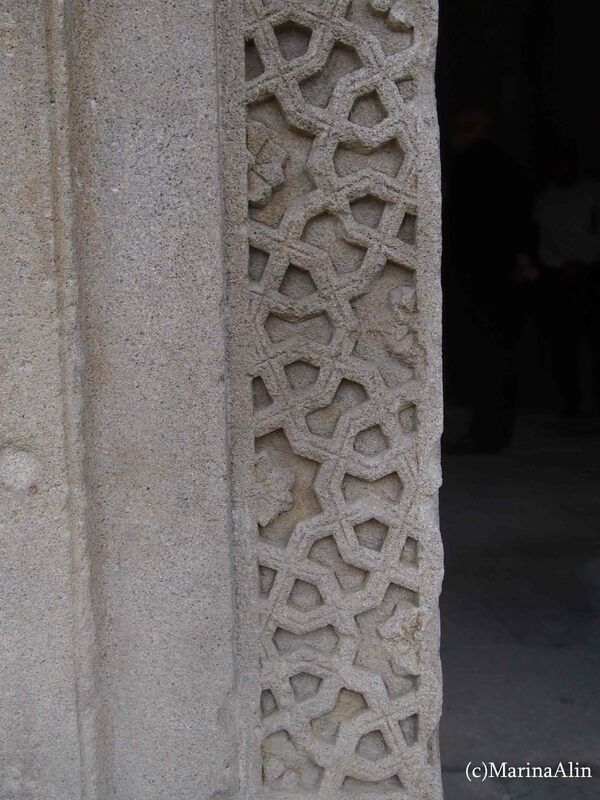 Motifs are biomorphic patterns, showing exquisite Rumi-style carving, fig and vine leaves, geometry and calligraphy, all carved 3-5 cm deep. 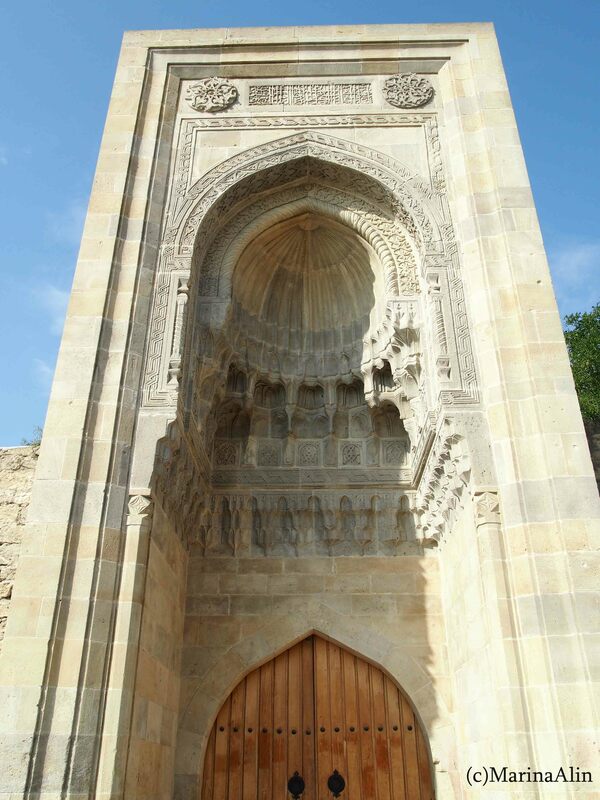 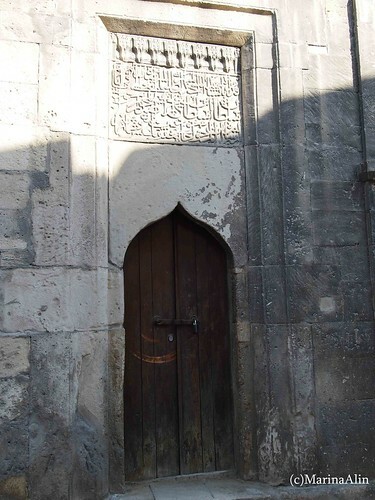 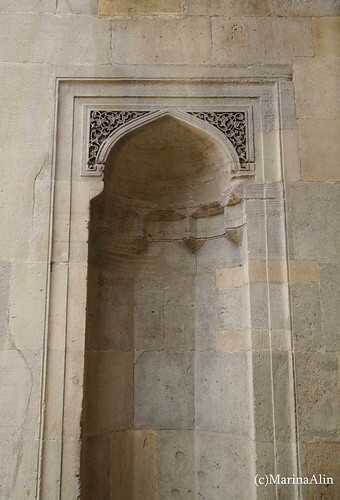 Muqarnas of portals are also carved. “The Complex of Shirvanshahs’ Palace is made out of well-hewn local limestone, called “badamdar”. Limestone being milky white, after grinding acquires golden tint” . 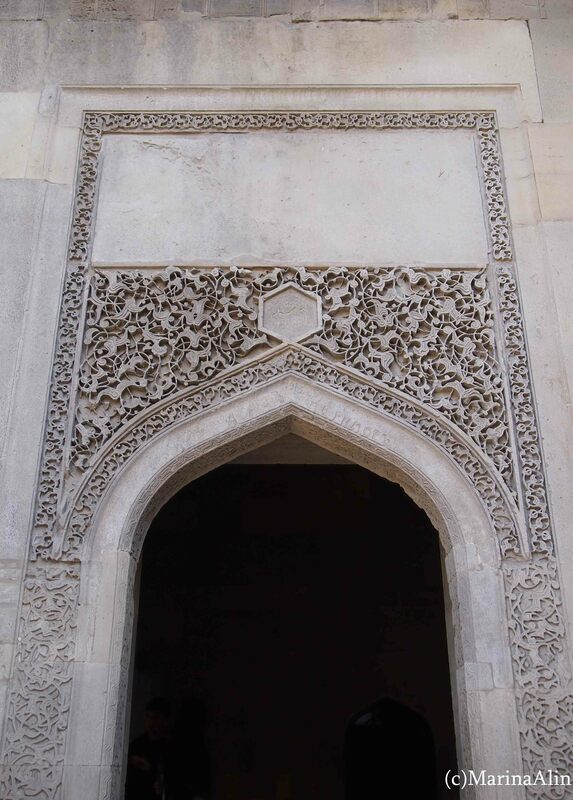 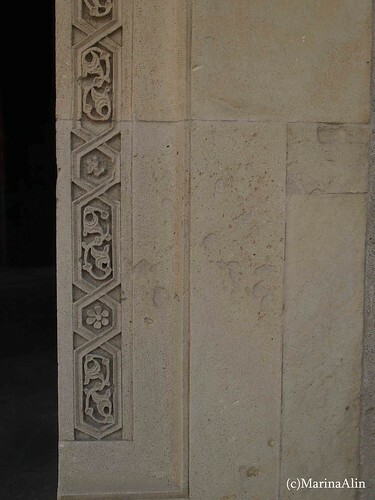 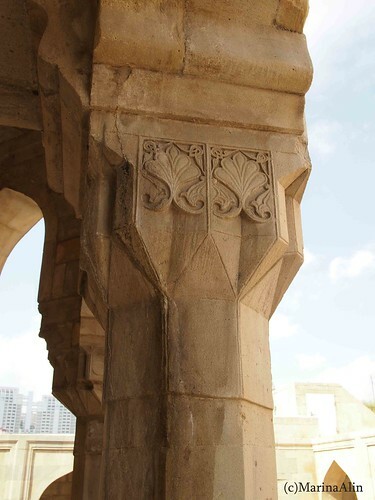 Hexagonal medallions over the arches of Mausoleum of Farrukh Yassar (octagonal building on the site of the palace complex, also called Divankhane) show stone carved calligraphy. 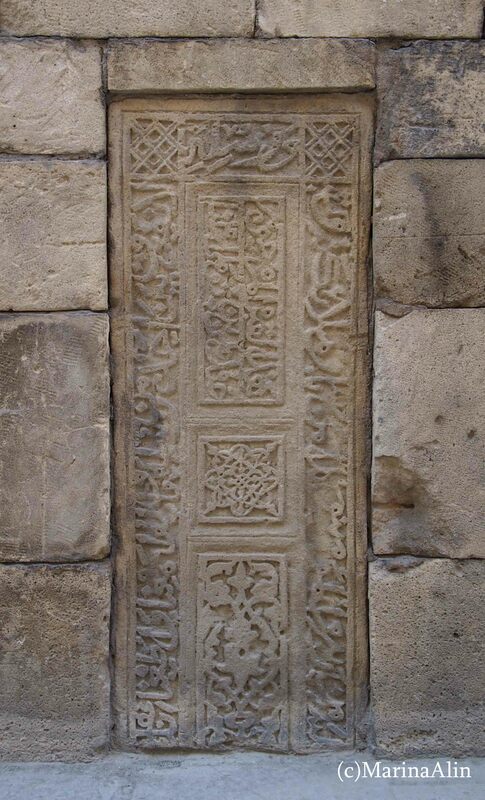 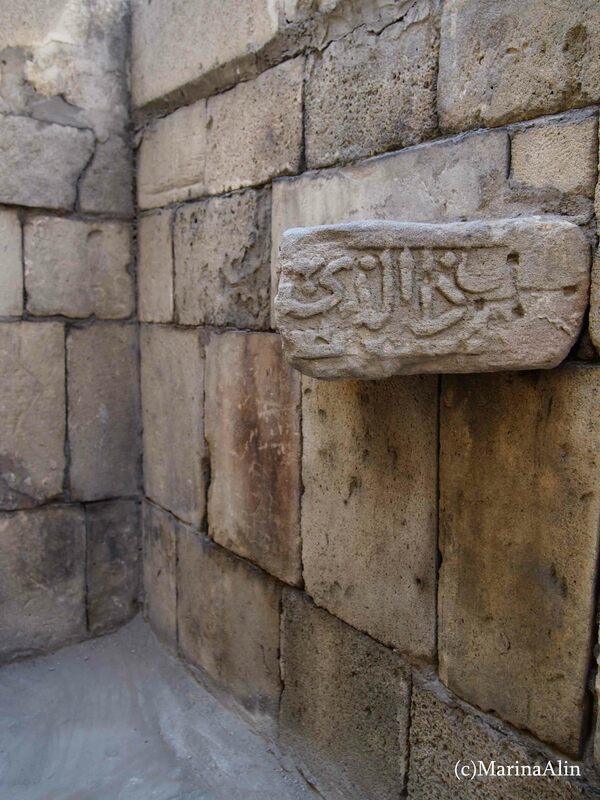 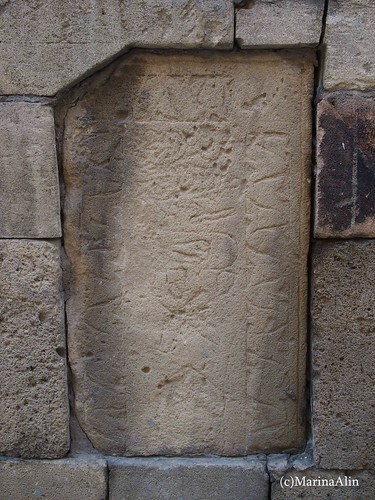 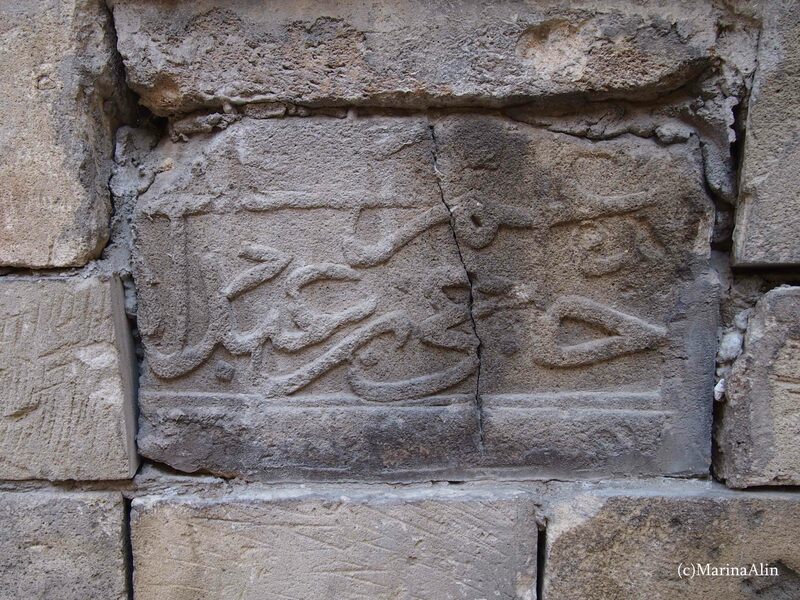 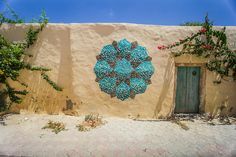 “Inscriptions are written in very ancient Kufic Arabic script. 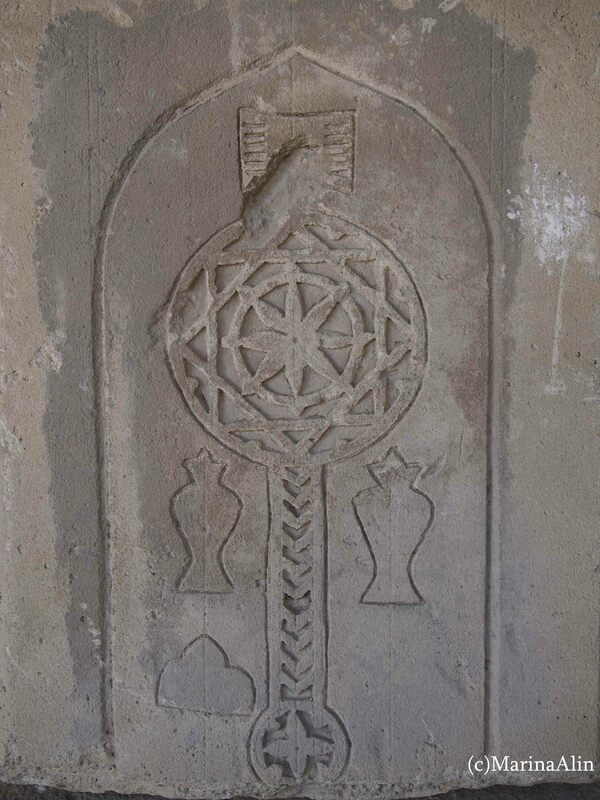 On the left inscriptions carved inside the medallion form six geometrical patterns in the form of rhomb. Two of them run: “There is no deity but Allah”. 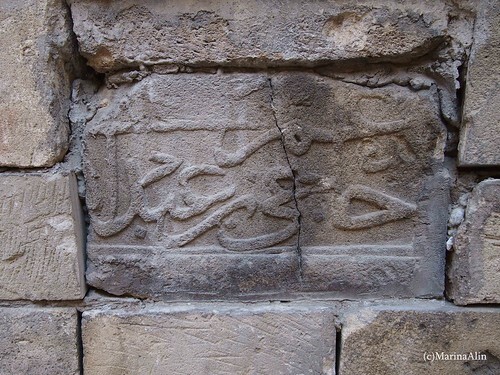 The other two read: “Prophet Mohammed is the messenger of Allah”. 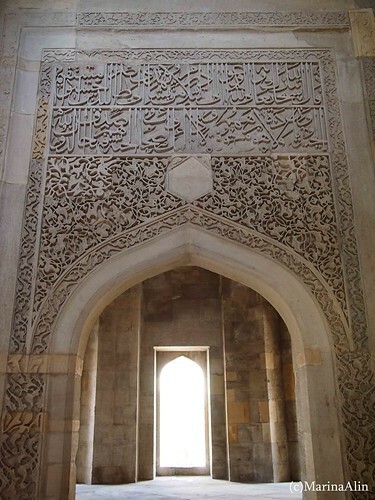 The rest of the rhombs run: “Imam Ali is close to Allah” . 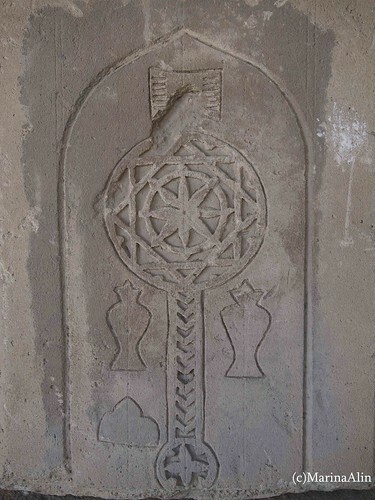 The hexagonal medallion on the right contains twelve small rhombs. 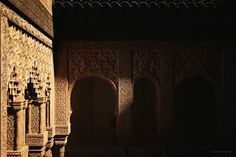 Six of them run: “Allah is single”, the other six bear the name “Mohammed”” . 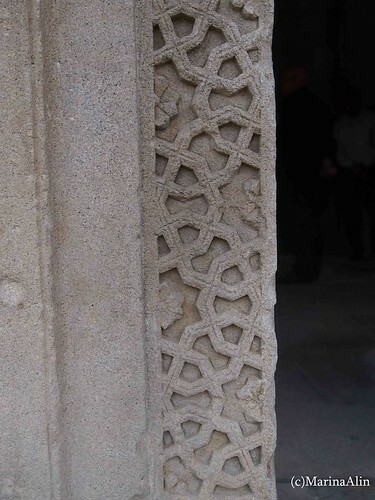 Windows of dwelling house of the palace complex are covered with stone lattices called “shebeke”. 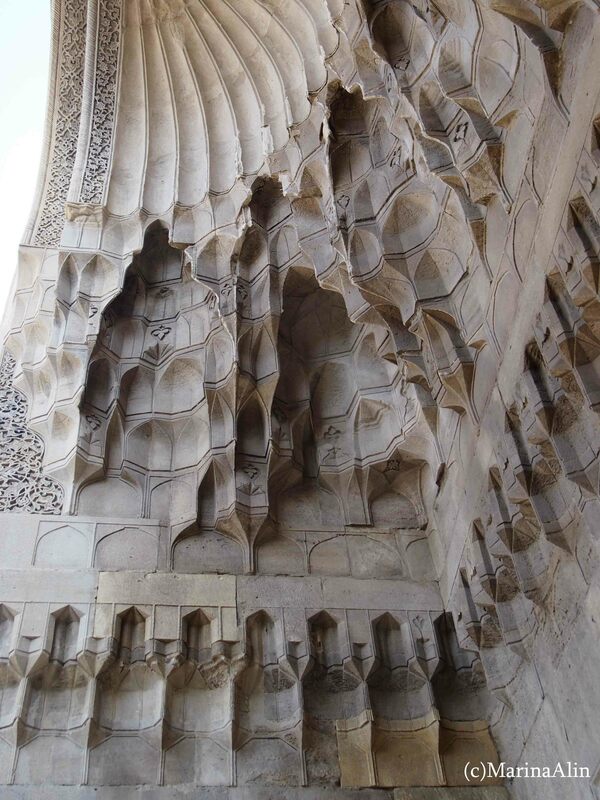 Carved out of stone they adorn a room with a pattern of light and shade. 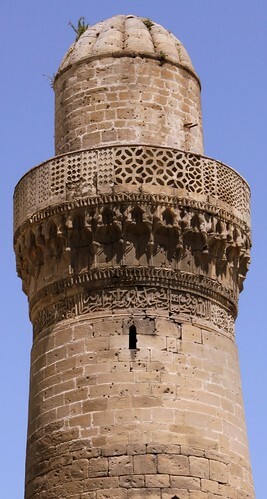 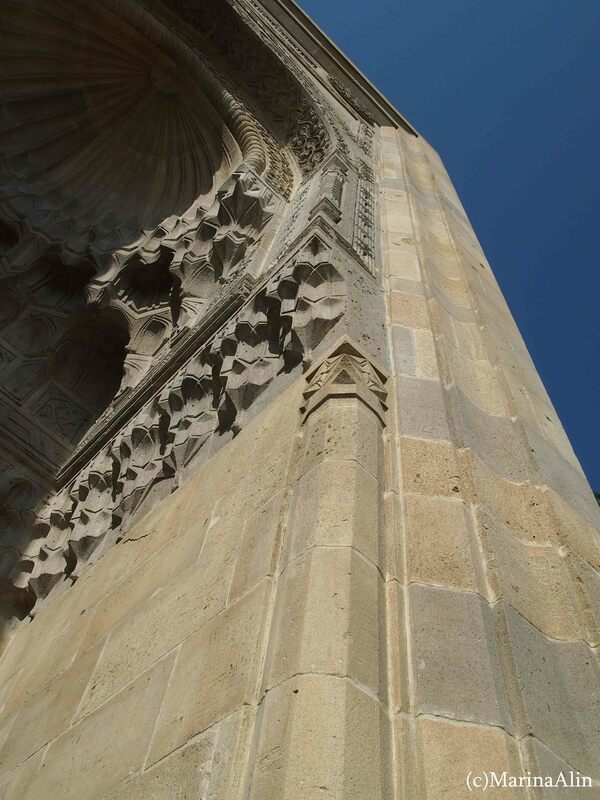 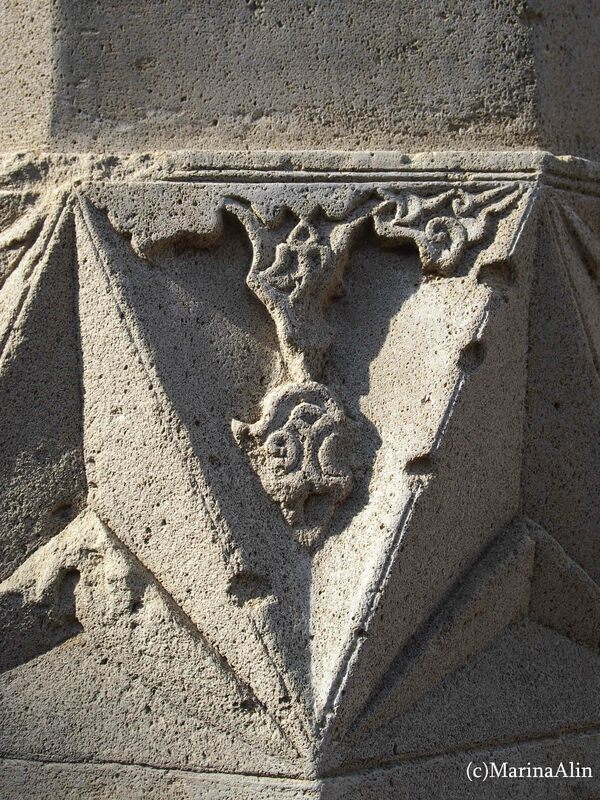 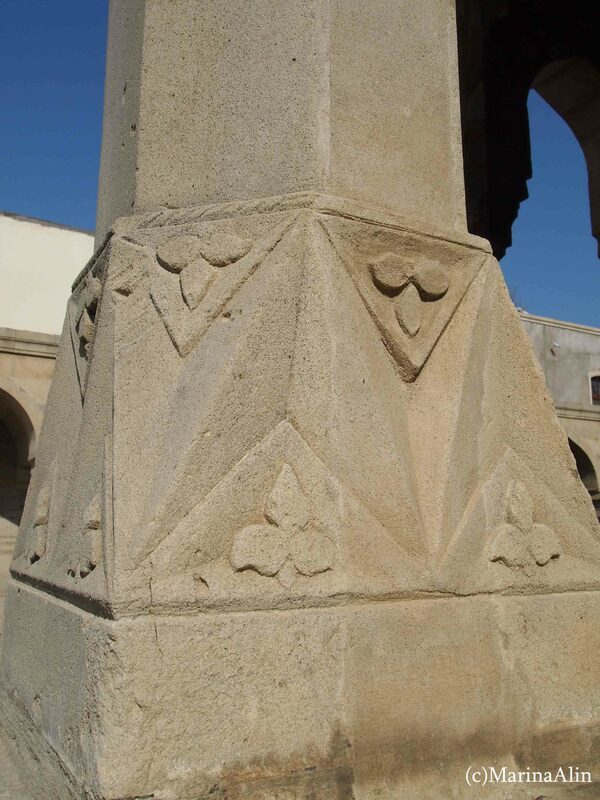 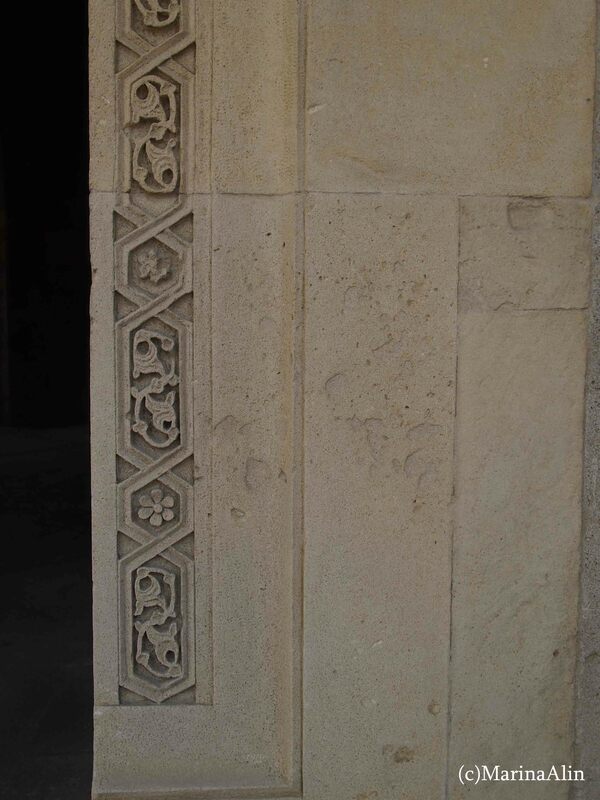 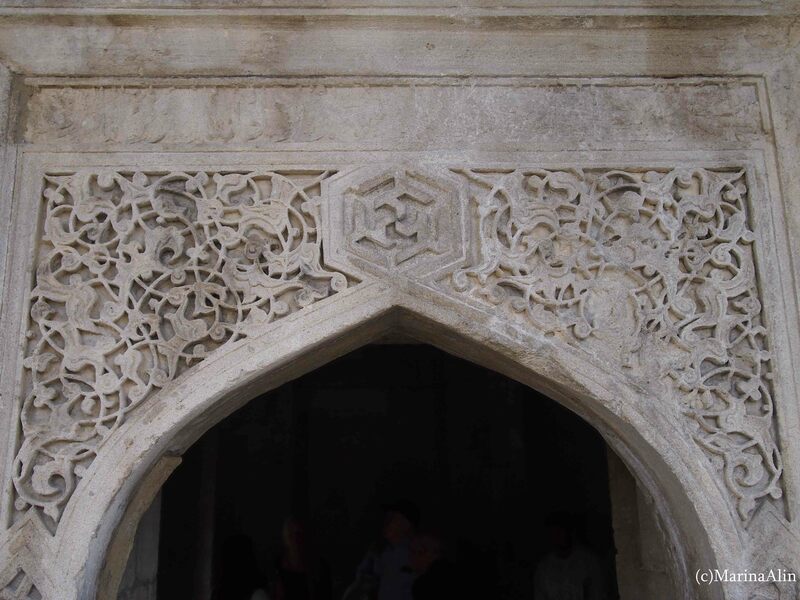 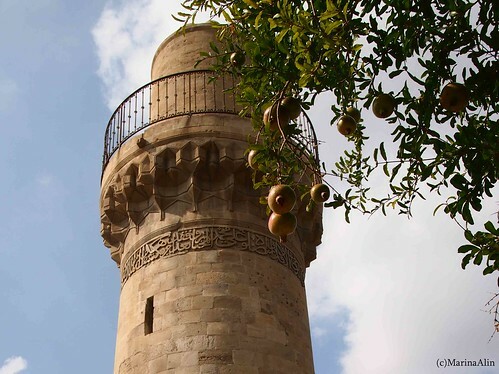 Apart from the decorations of Shirvanshahs’ palace there are some old minarets around the Icherisheher showing carving of geometry patterns and calligraphy. 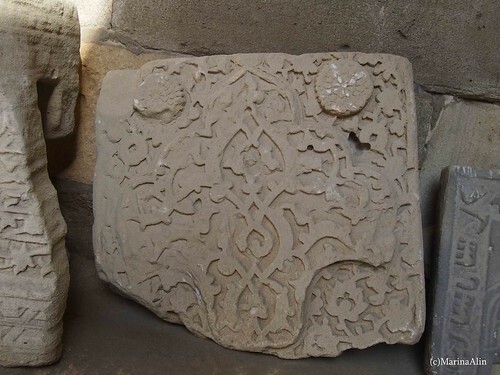 Other stone carved pieces are gravestones and gravestone panels with a variety of motifs. 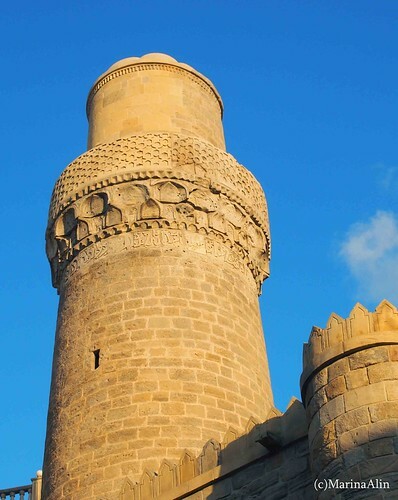 They are conserved in Icherisheher of Baku, in a city where history is carved out of stone. 1: Shirvan state existed in 9-17th century on the territory of modern Azerbaijan.